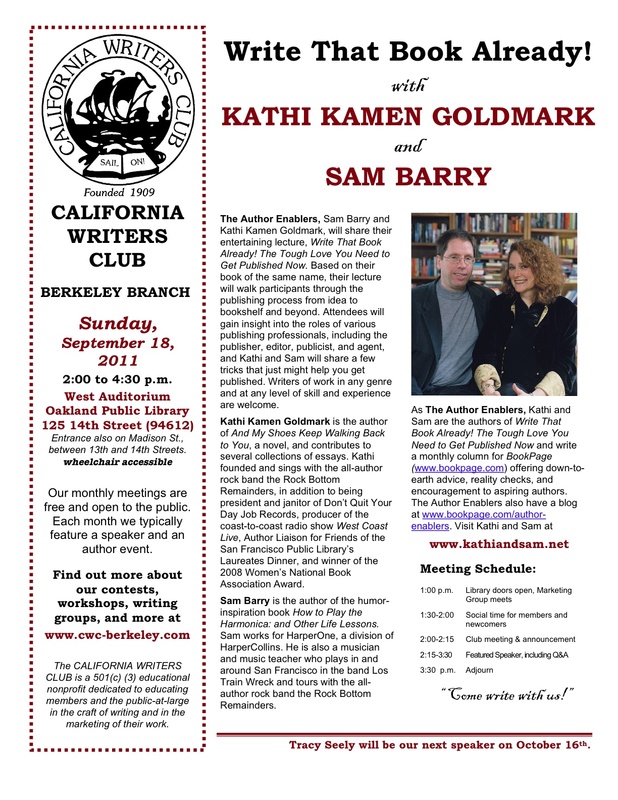 At our September meeting the Author Enablers, Sam Barry and Kathi Kamen Goldmark, will share their entertaining lecture, Write That Book Already! The Tough Love You Need to Get Published Now. Based on their book of the same name, their lecture will walk participants through the publishing process from idea to bookshelf and beyond. Attendees will gain insight into the roles of various publishing professionals, including the publisher, editor, publicist, and agent, and Kathi and Sam will share a few tricks that just might help you get published. Writers of work in any genre and at any level of skill and experience are welcome. Kathi Kamen Goldmark is the author of And My Shoes Keep Walking Back to You, a novel, and contributes to several collections of essays. Kathi founded and sings with the all-author rock band the Rock Bottom Remainders, in addition to being president and janitor of Don’t Quit Your Day Job Records, producer of the coast-to-coast radio show West Coast Live, Author Liaison for Friends of the San Francisco Public Library’s Laureates Dinner, and winner of the 2008 Women’s National Book Association Award. Sam Barry is the author of the humor-inspiration book How to Play the Harmonica: and Other Life Lessons. Sam works for HarperOne, a division of HarperCollins. He is also a musician and music teacher who plays in and around San Francisco in the band Los Train Wreck and tours with the all-author rock band the Rock Bottom Remainders. Whoops! It’s always in the flyer. I’ll post it on the sidebar!